Savings groups/credit unions serve as a financial intermediary within a village by mobilizing savings from rural households and extending loans to them. This system often encounters an issue of excess funds when total savings exceed loan demands within a credit union. In Thailand rural financial markets created by savings groups are segregated not only from those created by other savings groups but also from formal financial markets. Excess funds become a critical issue for some savings groups and hinder their development. On the other hand, in Japan, the market integration with respect to excess funds was pursued by organizing segregated rural credit markets (horizontal integration) and aligning rural credit markets with formal financial markets (vertical integration). This paper discusses the contrasting evolutionary paths of Japanese credit unions and Thai savings groups to offer practical insights for Lao savings group movement. Savings groups (hereafter SGs) offer a new approach for microfinance as referred to as microfinance revolution (Robinson 2001). As mentioned in the introduction of this special issue, SGs and credit unions are used interchangeably in this paper. The emergence of credit unions dates back to the nineteenth-century Germany and the movement had diffused throughout the world including Japan. The movement has long course of history that would elicit valuable lessons for the introduction of the SG in developing countries. The aim of this paper is to provide an analytical perspective for the development of Lao Village Savings and Credit Groups (hereafter also abbreviated as SG) by examining the growth paths of Japanese credit unions and Thai SGs as they show a stark contrast. We draw focus to two critical issues that determine the growth path of SGs. First, as the SGs accumulate savings, total savings tend to exceed loan demands especially among active SGs, causing an excess or idle funds issue. In Japan, excess funds provided momentum for the integration of rural credit markets into nationwide financial markets through policy interventions. On the other hand, in Thailand rural financial markets created by SGs are segregated not only from respective SG markets but also from formal financial markets. As a result, excess funds are likely to exert destabilizing influence on some of SGs. This contrast provides important clues for Lao SG movement. Second, the traits of agrarian society are likely to affect the growth path of SGs in a vital aspect of who take the initiative in the establishment and management of the groups. This suggests that unique policy interventions are quested for different countries, considering the features of respective agrarian society. Note that the agrarian structure is related to the management issue within the SG, but not directly to the coordination among the SGs especially with respect to excess funds. This paper is organized as follows. In section 2, we present two perspectives for discussion: an integration of rural financial markets created by SGs with nation-wide financial markets, and the effect of agrarian structures on the functioning and growth of SGs. Section 3 investigates Thai SGs mainly based on the household data collected in Northeast Thailand followed by an examination of Japanese credit union movement in section 4. Finally, section 5 summarizes the main findings and discusses their implications. The SG restricts the range of the operations to a small geographic area where sufficiently cohesive community mechanisms are obtainable for ensuring contract enforcement and quasi-perfect information about borrowers (Guinnane 2001).1) Violating this principle imperils the viability of the SG as discussed by the sixth article of this issue by Fujita. The community mechanisms are where the SG can advocate its advantage over formal banks. As the other side of the coin, a rural credit market created by a particular SG is not only segregated from formal financial markets but also segmented from other rural credit markets created by SGs in the absence of external coordination mechanisms. Due to this feature of the SG, successful development of an SG inevitably eventuates in an issue of excess funds as total accumulated savings surpass the total amount of members’loan requests. There are two plausible strategies to deal with excess funds with respect to the market integration: organizing segregated rural credit markets created by SGs (horizontal integration) and aligning those rural credit markets with formal financial markets (vertical integration). The former involves a transfer of money from savings-surplus SGs to savings-deficit SGs, and a ruling body is required to adjust excess liquidity among SGs by endorsing the transferred money. On the other hand, the latter implies a transfer of savings from SGs to formal financial institutions, especially banks. It should be noted that this savings mobilization can be done without establishing branch networks of banks. These evolutionary paths are historically traceable in Japan. In Thailand, however, little efforts have been made for the market integration. Contrasting strategies taken in the two countries lead to different growth paths of rural financial markets. The historical experiences of Japanese and German credit unions reveal that policy intervention to excess funds had facilitated the integration of rural credit markets with nation-wide financial markets. However, little attention has been given to the point in the current literature on microfinance in developing countries. The distinct strategies of Japan and Thailand on excess funds would provide suggestive hint for the development of Lao rural financial markets. Also noteworthy is the fact that SGs range in function across different agrarian societies. For example, agrarian society in pre-war Japan was basically landlord- dominated in that over 40% of farmland was tenanted. It was landlord class that exercised initiative in the wide sphere of village politics including the foundation and management of credit unions. On the other hand, Thai agriculture is dominated by peasant proprietors, and tenancy is modestly significant only in parts of the central plain. In Northeast Thailand, an egalitarian village structure has traditionally precluded acquisition of new land from poorer neighbors (Hirsh 1990). Thus, village leadership tends to be provided by an elder who is respected by the villagers (Seri and Hewison 2001) apart from his political and economic influence. We need to explore how the agrarian structure of the respective countries affects their SG movement. A major policy intervention in Thai rural financial markets was made in 1966 by the foundation of the state-owned Bank for Agriculture and Agricultural Cooperative (hereafter BAAC). The BAAC had gradually expanded its branch network. In 1996 (1970), the network had 535 (45) provincial and district branches and 875 (205) field offices. As of March 2008, the BAAC had a rural network of 75 provincial offices, 962 branches, and 956 field offices. It has expanded clients, outreaching approximately 98% of all farm households in Thailand in 2007 (Foundation for Development Cooperation and Banking with the Poor Network 2010). The BAAC was unconcerned with saving mobilization during its initial phase, because its operating funds had been furnished with from commercial banks and international agencies (Myer and Nagarajan 2001). In 1975, Thai commercial banks were regulated to lend 5% of their total lending of previous year to the agricultural sector. When the required amount was not disbursed, the remaining had to be deposited in the BAAC. The rate of quota was increased to 20% in 1987. The obligatory deposits from commercial banks had constituted the largest portion of the operating funds of the BAAC before the bank embarked on saving mobilization in 1989. In the sense that the BAAC could have procured loan funds without being devoted to mobilize savings from rural households, the BAAC is said to have been heavily dependent on subsidies (Sacay et al. 1996). In the wake of the financial crisis of 1997, the bank came to pay more attention to prudential regulations and became fully committed to savings mobilization. Establishing extensive branch network of the BAAC can be referred to as creating rural financial markets from above (a top-down approach). Though the BAAC has deep-ened its outreach gradually, it was far from sufficient in its early stages. Thailand is subdivided into 76 provinces ( changwat). As of 2006 there are 877 districts ( amphoe) except for Bangkok. Thus, each district has almost one BAAC branch and field office. However, as there are more than 70,000 villages ( muban) in Thailand, each branch/field office has to cover nearly 40 villages. Thus, villagers’ accessibility to the BAAC is considered far from satisfactory. In addition, the BAAC circumscribes the range of loans for production-oriented businesses, and does not serve as a consumption smoothing mechanism, especially for emergency expenditures. To supplement the areas and loan demands that the BAAC did not cover, in 1974 nation-wide movement to promote SGs for Production ( klum orm sup phua karn-pa-lid) started under the guidance of the Department of Community Development (DCD) of the Ministry of Interior (hereafter, DCD SGs). Though named as SGs for Production, DCD SGs serve loans for consumption purposes as well. This is partly because the rules of group were determined by village members themselves. As its loan funds are accumulated savings of the members, loan purposes can be at their discretion. The number of SGs showed a tremendous increase to 1,354 in 1980, and 9,927 in 1993. This movement can be referred to as creating rural financial markets from below (bottom-up approach). SGs were seemingly expected to carry out complementary functions until the BAAC attains full outreach. However, SGs still persist extensively in rural Thailand, despite of the BAAC’s current extensive outreach. This is partly because SGs extend consumption loans, and partly because some of the SGs offer emergency loans. SGs function as a device for consumption smoothing, while the BAAC does not. Consumption smoothing is one of the most expected function of SGs for the rural poor as is discussed by Fujita, Ohno, and Chansathith, the second paper in this issue. This paper examines three SGs in Northeast Thailand that showed different performance, based on our household survey (N=676) conducted in 2006/07: A DCD SG in Khone Kaen Province (hereafter K-SG), SGs under the technical and financial assistance of the Foundation for Integrated Agricultural and Environmental Management (FIAM) in Roi Et Province (R-SG), and a successful SG with an eminent leader in Chaiyapoon Province (C-SG). As the size of villages is small in Roi Et Province, R-SG contains seven SGs of adjoining villages. Of the three groups, K-SG shows the poorest performance, while C-SG outperforms others. The major characteristics of sample households are presented in Table 1. Being on the river, village C has pump irrigation facilities owing to which double-crop rice and vegetable farming are widely practiced. Villages R and C are in rain-fed areas. In village R, livestock farming contributes a significant part of agricultural income. However, the levels of cash income do not differ much among the three groups (Table 2). Accordingly, durable holdings indicate little difference among three groups (Table 3). Despite similar wealth levels of households, the three SGs show contrasting growth paths. Notes: a) 6.25 rai=1 ha. b) Marketed rice denotes the proportion of paddy sold to total paddy production. As the DCD program did not provide seed capital to SGs, the groups had to mobilize savings from the members for loan funds. The members are required to deposit monthly commitment savings, called sat-ja (a Buddhist term meaning sincerity). The monthly savings amount is fixed throughout a year so as to facilitate the calculation of dividends. The savings are treated as collateral to ensure loan repayments. The SG shares some features with rotating savings and credit associations (ROSCAs) in that they mobilize savings from their members and extend loans to them.2) ROSCAs participants have to bid for a loan and wait for their turn to borrow. Loans may not be available when needed, and savings may not be liquidated when needed. In the SG, on the other hand, the members can obtain loans in a set day as long as they want to borrow. In addition, the members are no longer required to borrow as long as they do not want to borrow. Thus, the SG performs a financial intermediation function, particularly between cash-surplus and cash-deficit member households more than ROSCAs do. In Thailand it is common that several SGs coexist in a single village, and villagers have memberships in a number of SGs. For example, village K has four SGs: DCD SG established in 2000, Farmers’ SG established in 1994, DCD SG of Queen’s Birthday established in 1995, and the Thailand Village and Urban Revolving Fund known as the Million Baht Fund established in 2001. All of these groups were established under the guidance of the government. Farmers’ SG was introduced by the department of agricultural extension in order to promote the sericulture industry. After a while, however, consumption loans came to be allowed. As it has similar traits with the DCD SG and they have a majority of common members, they hold a joint annual meeting in April. Both have commitment saving products. Members are required to deposit compulsory savings with a minimum amount of 10 baht every month. Considering that daily agricultural wage rate in the surveyed areas was 110 baht at the time of the survey, the amount of commitment savings is not a heavy burden for the rural households. As there are no external shareholders, the members are the owners of the groups. A major strength of the SG rests on the members’ sense of ownership. As the money loaned out is members’ deposits, members have an incentive to monitor their SG management and borrowers. Larger external financing, on the other hand, would weaken the common bond of the SG and undermine its development.3) The dividend distributed to members is directly proportional to the amount of savings each individual has contributed to the groups.4) The net profit of SGs calculated at the time of an annual meeting is distributed according to the group regulations. The total deposits amounted to approximately 230,000 baht for the Farmers’ SG and 50,000 baht for the DCD SG. The average amount of savings per member is 2,000 and 800 baht respectively, which are far from satisfactory when compared to the daily agricultural wage rate of 110 baht. As accumulated deposits solely constitute the funds for lending, and 70 to 80% of the members are said to apply for loans, average loan amount exceeds average savings only moderately. This is what Coleman (1999; 2006) claims that the loans from SGs in Northeast Thailand may be too small to make a notable impact on the welfare of households. It is possible to see this situation as one obtains loans from her deposits, paying interest. The members seem to regard the SG as a device of self-control or spouse control to refrain from impulsive spending. Loans are made only once a year at the time of an annual meeting with one year loan period. Interest rate is set at 3% a month on a simple interest rate basis and lump-sum payment is the rule. Though the loan ceiling is set at the amount of borrower’s savings, loans three times more than borrowers’ savings are permitted as far as other members admit to be cosigners using their savings as collateral. Cross collateralization is a general rule of the surveyed SGs. There are different operations between Thai and Lao SGs. As is so in Thailand, Lao SGs demand commitment savings with which they purchase shares. One share is priced at 5,000 to 10,000 kip per month in general, and the members have to purchase at least one share every month. However, Lao members can purchase as many shares as they can afford every month. In addition, the members can apply for a loan every month at the time of a monthly meeting with a loan ceiling set at five times as much as the amount of their savings.5) Loan period is three to six months. Thus, Lao SGs are more flexible, and thus practical in operations than Thai ones. Operational inflexibility of DCD SGs is partly because villagers having little bookkeeping experience to manage the groups. The government did not provide any assistance on work contents for the villagers. Actually, as there is no stylized bookkeeping format, the record of deposits, loans, and repayments are often jotted down in a notebook. This causes troubles, for example, if a debt was cleared or not. In addition, there are no internal and external auditing mechanisms to check group books. This is apt to disturb members if the money they deposited is properly managed. For example, once a rumor that the committee members embezzled the deposited money circulated among the members of K group. This triggered a run on the SG. After withdrawing all the deposits, the members confirmed it was just a rumor and restarted to make deposits. On the other hand, in Laos international NGOs have implemented training programs, and request Lao SGs to submit a quarterly financial report for monitoring. The Million Baht Village Fund Program launched in 2001 is another reason behind the poor performance of DCD SGs. The program injected a million baht (approximately US$22,500) to every village and urban community in the country as working capital for locally-run rotating credit unions. Villages were required to set up village fund committee to run the fund, and to establish regulations in line with a guideline given by the National Village and Urban Community Fund Office. By 2002, 92% of Thai communities had formed the committees, and by May 2005, 99.1% of all villages had the Million Baht Fund in operation (Arevart 2005). According to Kaboski and Townsend (2009), the typical loan amount extended in the Million Baht Fund should be below 20,000 baht, and the loans need to be secured by guarantors among the members. As no collateral is demanded, the Million Baht Fund restricts loans to productive purposes. Loan duration is 12 months and the interest rate is 7% per annum. In Village K, for example, all the households participate in the program. The members deposit commitment savings (20 baht) every month as a condition of receiving a loan. Villagers seem to perceive the commitment savings as a membership fee to obtain a loan, because the amount of the commitment saving is negligible compared with the allowable amount of loan of 20,000 baht. In other word, villagers can access loans from the Million Baht Fund without sizeable savings. In village K, the accumulated savings of the DCD SG and the Farmers’ SG (50,000 and 230,000 baht) are far short of 1 million baht. In addition, annual interest rate of the Million Baht Fund (7%) is significantly lower than that of other SGs (36%). The emergence of the Million Baht Fund, thus, debilitated villagers’ propensity to saving in the SGs. Poor external assistance to train committee members and the emergence of the Million Baht Fund are likely to make DCD SGs inactive and fragile. FIAM, a Thai NGO established in 1988, started all sorts of assistances in Roi Et Province of Northeast Thailand, including the provision of toilets, jars for drinking water, lunches for local schools, and the establishment of buffalo banks. In 1994 FIAM embarked on the rehabilitation program of DCD SGs with financial assistance from an American NGO, Catholic Relief Services (CRS). FIAM conducted a training program on basic bookkeeping using stylized account ledgers and passbooks for committee members. The members set regulations by reference to the model regulations offered by FIAM. The following discussion is based on the data collected from seven DCD SGs (group-1 to group-7) assisted by FIAM in Roi Et Province. FIAM makes a loan of 1,500 baht per member as seed capital (external account) with the flat interest rate of 2% per month. As the loans from CRS are provided in a series of six month cycles with lump-sum payments, loan period to the members has to be six months. In addition to the external account, the SGs have internal account contributed by members’ commitment savings. After the accumulated commitment savings come to satisfy the credit requirements of the members, the SG is declared graduation from FIAM assistance to be registered as a credit union. All the seven villages have their own Million Baht Fund. Its loan ceiling is set at 20,000 baht and all the borrowers obtained the ceiling amount. As one million baht was injected regardless of the village population, the SGs of villages such as groups 4, 6, and 7 received a relatively intense injection in terms of per capita funds (Table 4). This deteriorated the performance of DCD SGs. For example, group-6 was established in 1998 with 32 members, and FIAM started to support it in 2000. In 2001 the Million Baht Fund started operating in the village. This made the DCD SG unattractive to the villagers. The members came to be less committed to the group, and five members withdrew from the group. On the contrary, the SGs established far before the introduction of the Million Baht Fund and having relatively larger members, such as group-1 and group-2, have remained less affected by the Million Baht Fund and they showed favorable performance. Source: Internal documents of FIAM. Note: Assessment is conducted by FIAM. Generally speaking, the advent of the Million Baht Fund discouraged the members of DCD SGs from committing to their SGs. FIAM, thus, lost its ballpark in Thailand, and decided to shift its major target areas to Laos. While most of DCD SGs in Thailand have lost dynamism in the 2000s due to the implementation of the Million Baht Fund, some met with success. C-SG was set up in 1987 by the village elementary school principal, following the guidance of DCD. Village C engages in vegetable cultivation that occupies approximately 70% of arable land of this village. There are 14 pickup trucks in the village for transporting vegetables to Nakhon Rachasima, one of the major cities of Northeast with two hour distance by road. The most distinctive feature of C-SG consists in the prominent leadership of the founder. He set the strict group regulations, and an annual report of the group is distributed to the members to ensure transparency of group administration. The report dis-closes not only the detailed financial positions of the group, but also the names of group members together with the amount of savings, loans, and dividends. The report preserves the transparency of the group’s accounts. In addition, group C supplies more flexible loan services in that the members can take out loans several times a year until the ceiling is reached. Thus, C-SG has a similar management practices with Lao SGs than other Thai SGs discussed in this paper. Loan rate of interest is 1.5% per month (18% per annum) with 12 months loan period. At the time of survey total savings amounted to 12.4 million baht, and per capita savings was approximately 20 thousand baht. Thus, average amount of savings per household reached nearly 60 thousand baht. Because of this immense amount of savings, C-SG could have remained unaffected by the Million Baht Fund. The immense amount of savings, however, causes a problem of excess funds. As the annual rate of dividend is approximately 13%, which is significantly higher than the deposit interest rate of commercial banks, 0.75% per annum, the members are willing to deposit money in the SG. This annoys the founder in that an issue of excess funds becomes more likely and a high dividend will not be assured anymore. Though he proposed the reduction of the lending interest rate at an annual meeting, the members expressed their opposition to it with a fear of lowering dividend. To deal with an excess funds issue, C-SG put a 200,000 baht cap on savings per person. At the time of the survey, five members had reached this limit. However, the chairperson thought this was just an emergency measure insufficient to cope with excess funds properly. The Thai government took a twofold approach to the development of rural financial markets: the top-down approach through the BAAC, and the bottom-up approach through SGs. However, the government has made little attempt to coordinate the two approaches. In addition, the markets created by SGs are separated from each other because no ruling body was established to integrate them. The segmentation of rural credit markets is likely to exacerbate the problem of excess funds among thrived SGs. Furthermore, due to the lack of policy coherence on the SG movement, there coexist several SGs within a single village. This causes the problem of over-indebtedness or borrowing for reimbursement purposes. To deal with excess funds C-SG resorts to two measures. First, as already mentioned, the committee set a ceiling on the amount of total savings. Some of the FIAM assisted SGs have a similar regulation that sets 10,000 baht as a ceiling. C-SG deposits nearly two million baht in commercial banks, but at the annual interest rate of mere 0.75%. Due to the absence of a ruling body, the saving capability of rural households cannot be parlayed effectively. Second, C-SG embarked on a joint purchase business of agricultural inputs in 2001, using the excess funds. For example, a member purchases a bag of chemical fertilizer at 420 baht on credit through the group shop, and half year later he pays 450 baht after harvesting paddy. The 30 baht margin represents 6.7% of annual interest rate. Though 438 thousand baht was applied to the joint purchase business in 2004, the investment accounted for mere 3.53% of the total deposits. Table 5 shows the number of financial institutions from which the sample households obtained loans. Approximately 80% of the households are indebted, and one-third obtained loans from several financial institutions. Table 6 indicates the proportion of households that obtained a loan from the respective financial institutions. In village K the Million Baht Fund seems to have crowded out the DCD SG, because the latter had mobilized relatively small amount of savings. On the other hand, C-SG that accumulated huge amount of savings serves as a major financial institution in the village even after the advent of the Million Baht Fund. The problem of over-indebtedness can be seen from Table 7 that indicates the intended allocation of windfall income (approximately US$100).7) For comparison, the results obtained from Lao villages in Vientiane are presented for the village with (N=332) and without (N=259) SGs based on our survey conducted in 2007. In Thailand, nearly 30% of windfall income is indicated to be allocated to repay debts. Plural SGs in a single village are likely to jeopardize the disciplined saving behavior of the villagers. In economics, competition is supposed to yield favorable outcomes in the market. However, competition may be detrimental to the borrower’s behavior in a microfinance market (McIntosh and Wydick 2005; McIntosh et al. 2005). Note: Commercial bank includes BAAC. “With” and “without” denote villages with and without an SG respectively. By way of concluding this section, it must be emphasized that Thai SGs are mostly inactive due to inappropriate and inconsistent government intervention. Some NGOs such as FIAM have acted as a substitute for government support, but only to limited areas. Though leadership as observed in C-SG will be an effective solution for proper group management, we cannot expect such leadership everywhere at any time. Thus, it is imperative that government policy intervention support and audit village SGs. 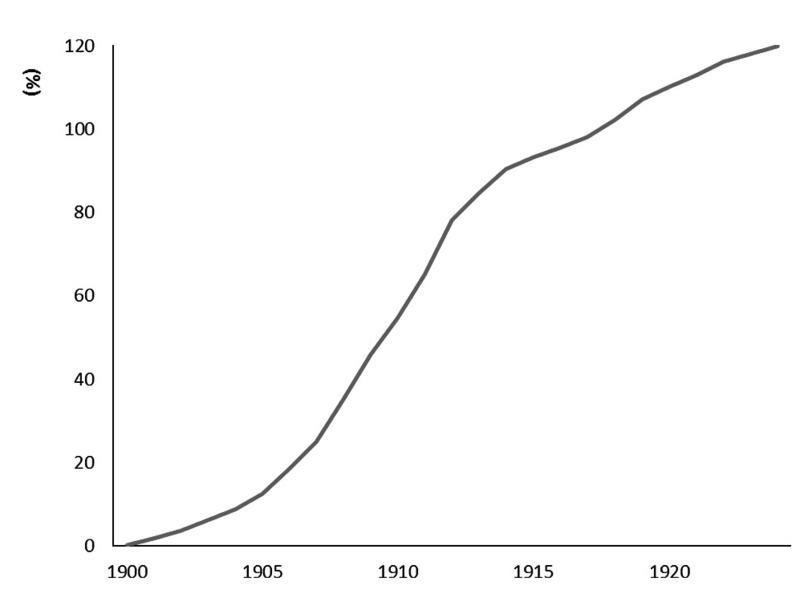 Modern credit union movement in Japan was initiated by the Industrial Cooperative Law of 1900 modeled on the German cooperative act of 1899.8) The proportion of credit unions to total number of municipalities surpassed 100 at the end of 1910s (Fig. 1), indicating that credit unions became widely prevalent across the country. Unlike the SGs of Thai and Laos, Japanese credit union was allowed to serve three additional functions of marketing, purchasing, and joint production union as industrial cooperatives.9) Even in the case of combining two or more functions, however, credit union occupied a critical position. Source: Sangyo Kumiai Chuokai (Various years). Note: Growth of credit unions is indicated by the number of credit unions over the number of municipalities in Japan. Table 8 indicates the sources of borrowing by the rural households belonging to different economic strata in 1932. A wealthier stratum of the agrarian society, the landlord class, could obtain bank loans, while poorer strata, inter alia the tenant class, had to rely mostly on informal financial institutions such as ROSCAs and individuals lenders. Credit unions occupied one of the major sources of borrowing across all the strata. Fifty seven percent of rural households joined credit unions, and the proportions of credit union membership were almost same across strata except for miscellaneous that includes traders and non-farm producers (Table 9). Thus, credit unions could have outreached the village poor. The loan-to-savings (LTS) ratio (B/A), a ratio between the SG’s total loans and total savings, is below 1 for the landlords (0.65) and miscellaneous, while it is highest for tenants (1.65). Accordingly, Japanese credit union had served as a financial intermediary between cash-surplus and cash-deficit households within a village community. Source: Norin-sho Keizai Kosei-bu (1938). Japanese credit unions procured their loan funds in a different manner from Thai and Lao SGs (Table 10). By definition, internal funds should constitute a major part of loan funds of credit unions. As to Thai and Lao SGs, members’ savings are the sole source of internal funds, except for the groups supported by Thai FIAM. As members’ deposits are called shares, SGs are owned by the members. They receive dividends according to the number of shares they hold. On the other hand, a major portion of internal funds of Japanese credit unions at the early stage was paid-up share capital supplied primarily by the wealthier strata of the agrarian society—mostly landlords. They also contributed funds by taking loans (debts loan) from local banks. The members from relatively poor strata deposited savings with fixed interest instead of purchasing shares. Thus, Japanese credit unions possessed similar features of the banking system. The characteristics of Japanese agrarian society might predominate as the cause of this contrast. The agrarian society in pre-war Japan was basically landlord-dominated as approximately 40 to 45% of farmland was tenanted.10) Under this skewed socio-economic status within a village, it was the landlord class that afforded initial funds to credit unions. Several factors were likely to serve as triggers of organizing credit unions under the leadership of landlords. First, the latter half of the Meiji era (1868–1912) witnessed an increase in the use of chemical fertilizer.11) Purchasing chemical fertilizer was ranked at the top reason of borrowing from credit unions. The use of chemical fertilizer would have not only stabilized livelihood of farmers, but also secured land rent for landlords. Second, since around the turn of the nineteenth century, a number of local banks were established with a maximum of over 2,000 in the early 1900s. Faced with severe competition for deposits, the newly-established banks were in the dearth of funds. It is known that a great number of landlords who participated in the establishment of credit unions took a stake in local banks as well. For such a wealthier agrarian class, credit unions were a device designed to transfer savings from rural areas to the banks. Thus, the landlords were motivated to manage credit unions properly and made an effort for the accumulation of savings by persuading community members to save money at credit unions. For example, Kanai credit union in Yamagata prefecture set the 20th of each month as the day of deposits. Rotatory persons in charge of every hamlet of the village collected deposits from the members and brought them to the business premise of the credit union (Sangyo Kumiai Chuokai 1906). The literature on Japanese credit unions mostly claims that the government had provided little support at the initial stage of credit union movement. However, this does not imply that the government was indifferent to the movement. The government intended to pave a way to facilitate the credit union movement and to integrate the segmented credit markets into nation-wide financial markets. After the enactment of the Industrial Cooperative Act of 1900, the Ministry of Agriculture and Commerce provided the prefectural governments with the model form of cooperative regulation, and county chiefs organized the campaigns for cooperative movement. Industrial cooperatives began to be organized under the guidance of the heads of regional governments. The Central Cooperative Federation (hereafter Central Federation) was founded in 1905 as a voluntary association under the leadership of Tosuke Hirata, ex-Minister of Agriculture and Commerce, who laid the foundation of the Industrial Cooperative Law. The revised Industrial Cooperative Law (1909) admitted the federation as a judicial entity. In addition, the regional cooperative federations as the second tier were organized across the country. The areas covered by the second tier federations did not coincide with the realm of prefectures in the first place. After alignment efforts were made, each prefecture came to have a single second tier cooperative. Thus the second tier is referred to as Prefectural Federation, hereafter. The declining trend differed among regions as is shown in Fig. 3. For presentation ease, the figure includes only major zones of Japan: agriculturally backward zones of Tohoku (Northeast) and Kanto (Tokyo and its vicinity), and agriculturally advanced zones of Kinki (Osaka and its vicinity) and Western Japan. The LTS ratios were high in all the zones in the initial stage, because savings accounted for only a smaller portion of loan funds. 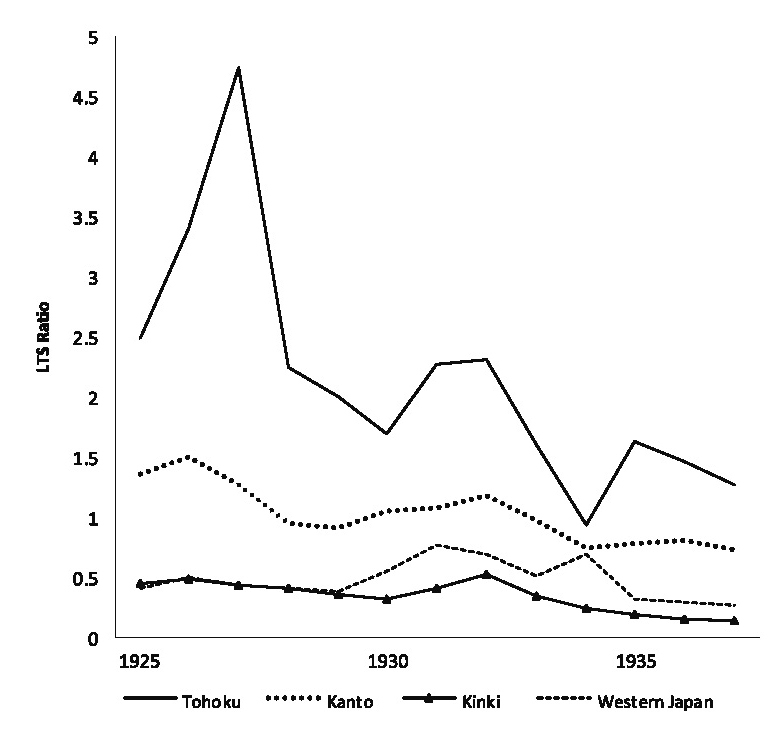 However, the ratios declined drastically, especially in Kinki and Western Japan of agriculturally advanced zones. On the other hand, the ratio had remained above 1 for long in agriculturally backward zones of Tohoku and Kanto, suggesting the dearth of funds. This quested for horizontal integration of credit unions to coordinate demand and supply within and among prefectures. The Central Federation advocated horizontal integration of credit unions by establishing the Central Cooperative Bank as early as in 1906, partly in response to the request made by credit unions in Tohoku zone suffering from the dearth of funds (Norin Chuo Kinko 1973). Excess funds in Japanese rural credit markets were transferred to nation-wide financial markets through the government bond market and deposits in commercial banks after the second half of the 1910s. However, this does not imply unidirectional cash flow from credit unions to nation-wide financial markets. As a final point, it may be worth mentioning about nation-wide rural development programs through rural financial markets in Japan and Thailand. Their distinct implementation processes reflect the features of policy intervention into rural financial markets in the two countries. The rural economy of Japan was seriously damaged by the Great Depression of 1929. The government embarked on the Economic Rehabilitation Movement (Keizai Kosei Undo) in 1932 to recover devastated rural economy. It was a bottom-up program in that the village communities had to submit a rehabilitation draft and that they were responsible for implementing the plan. Credit unions were expected to be a pivotal actor for a capital infusion in the vertically integrated financial system. In 1933 the first five-year plan for the intensification of industrial cooperatives was launched. The plan intended to set up industrial cooperatives every village and those fully equipped with the four functions of credit, marketing, purchasing, and production. Thus, the program is said to pursue comprehensive development of rural economy. In addition, the government promulgated the Debt Clearance Act in 1933 to rehabilitate debt-laden farmers sprung up by the Great Depression. Debt clearance unions were set up across the country, and credit unions assumed a vital role in debt clearance. Thus, credit unions embedded in the nation-wide financial markets were vital actors of a bottom-up government policy for the development of rural economy. Source: Norin Chuo Kinko (1973). The Million Baht Fund program of Thailand launched in 2001 is the largest scale government microfinance initiative in the world. Village communities were required to set up a local committee to run the fund and to draw up the rules for operations such as interest rate, loan duration, maximum loan size, and objectives. Unlike the Economic Rehabilitation Movement of Japan, existing SGs were kept out of the loop in the program. Though the Million Baht Fund demands commitment savings from members as rotating credit union, the amount, normally 20 baht per month, is virtually negligible compared with the average loan amount of 20,000 baht. In addition, the committee is not allowed to handle funds directly, but is required to open an account at the BAAC.16) A million baht was disbursed to and held at the BAAC. Thus, the Million Baht Fund should be characterized as rural financial institutions based on a top-down approach. The two nation-wide rural development programs show a distinct contrast in terms of a bottom-up and a top-down approach. The contrast is in line with the distinct evolutionary path of rural credit markets of the two countries. Creating rural financial markets is challenging policy intervention for decades in developing countries. While poverty alleviation has been paid attention somewhat overly in the literature of rural financial markets, little was discussed on the integration of rural credit markets into nation-wide financial markets. The integration concerns the system of saving mobilization from the rural sector to fuel industrialization and the infusion of capital into the rural sector to address the issues of rural development or rehabilitation. Though community mechanisms provide a basis for sustained management and growth of the SGs, the mechanisms cannot cope with coordination of the SGs for establishing integrated financial markets. This paper discussed the contrasting evolutionary paths of Japanese credit unions and Thai SGs to offer practical insights for Lao SG movement. We traced the history of credit unions of Japan and SGs of Thailand with a focus on the integration process. Though both countries have conducted policy intervention to create rural financial markets, their growth tracks showed a contrasting picture in that Japan pursued the bottom-up approach while Thailand employed the top-down approach. As rural institutions including credit unions are deeply embedded in distinct agrarian structure, any investigation neglecting the embeddedness would lead to incomplete policy implications. In addition, the Japanese government attempted to integrate the segmented rural financial markets of credit unions horizontally and vertically, while the Thai government has been almost indifferent to the integration. The outcomes of these approaches would offer practical insights into the development of rural financial markets in developing countries including Laos. As mentioned Lao SG movement was initiated by Thai NGO (FIAM) that has promoted microfinance in Northeast Thailand, following the village bank methodology of the Foundation for International Community Assistance (FINCA). FIAM shifted its area for major activity to Laos in the latter half of the 1990s. Though Lao SGs are structured in accordance with the Thai FIAM model, they show clear distinctions. First, while Thai FIAM offers seed money to the assisting SGs, Lao FIAM does not or offers only limited amount if any to the SGs. Lao SGs, thus, had to mobilize internal savings for working operational funds from the start. Second, Thai SGs are stand-alone without ensuring any authorized formal linkage with either other SGs or formal banks, while Laos started to connect themselves to transfer excess liquidity to the SGs in the dearth of funds since 2007, even though with a limited effect. Lao SG movement started to pursue horizontal integration with leaving vertical integration untouched. In this sense Japanese experiences would provide more relevant framework for Lao SGs. However, it should be noted that Lao agrarian society has more similar features with Thai society rather than pre-war Japanese agrarian society in that Lao and Thailand farmers are more egalitarian in landholdings than landlord-dominated Japanese society. Considering the fact that Japanese landlords took positive initiative in creating rural financial markets in pre-war Japan, policy interventions including NGOs support come to be critically important for the development of Lao SGs. Ando Yoshio 安藤良雄. 1979. 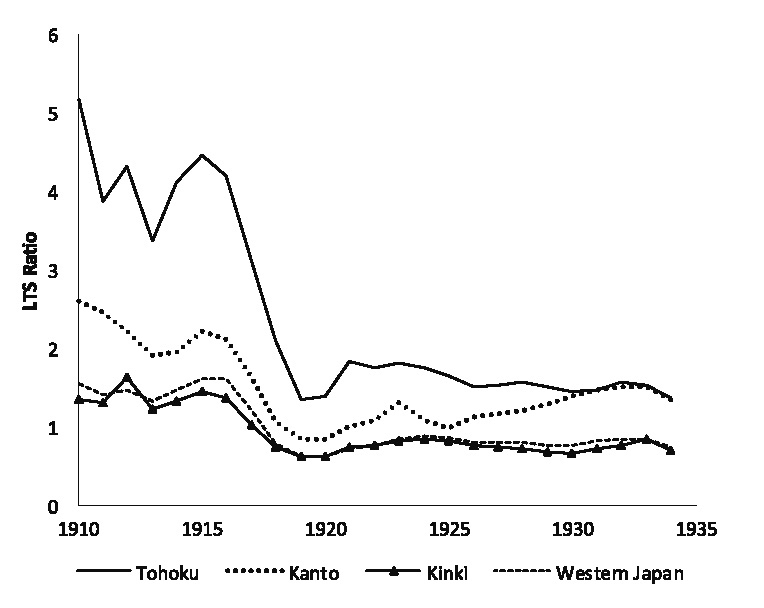 Kindai Nihon Keizaishi Yoran 近代日本経済史要覧[Handbook of modern Japanese history]. Tokyo: University of Tokyo Press. Arevart, Aupot. 2005. Village and Urban Community Fund Project (VUCFP). Office of the National Village and Urban Community Fund. Bouman, Frits J. 1995. Rotating and Accumulating Savings and Credit Associations: A Development Perspective. World Development 23 (3): 371–384. Coleman, Brett E. 2006. Microfinance in Northeast Thailand: Who Benefits and How Much? World Development 34(9): 1612–1638. ー. 1999. The Impact of Group Lending in Northeast Thailand. Journal of Development Eco nomics 60: 105–142. Foundation for Development Cooperation; and Banking with the Poor Network. 2010. Micro finance Industry Report Thailand. Guinnane, Timothy W. 2001. Cooperatives as Information Machines: German Rural Credit Cooperatives, 1883–1914. Journal of Economic History 61(2): 366–389. Hayami Yujiro 速水佑次郎. 1973. Nihon Nogyo no Seicho Katei 日本農業の成長過程 [The process of Japanese agricultural growth]. Tokyo: Sobunsha. Hirsch, Philip. 1990. Development Dilemmas in Rural Thailand. Singapore: Oxford University Press. Ishikawa, Shigeru. 1967. Economic Development in Asian Perspective. Tokyo: Kinokuniya. Kaboski, Joseph P.; and Townsend, Robert M. 2009. The Impacts of Credit on Village Economies. MIT Department of Economics Working Paper No. 09-13. Retrieved January 15, 2015 from SSRN: http://ssrn.com/abstract=1395348. McIntosh, Craig; and Wydick, Bruce. 2005. Competition and Microfinance. Journal of Development Economics 78: 271–298. McIntosh, Craig; de Janvry, Alain; and Sadoulet, Elisabeth. 2005. How Rising Competition among Microfinance Institutions Affects Incumbent Lenders. Economic Journal 115(506): 987–1004. Myer, Richard L.; and Nagarajan, Geetha. 2001. Rural Financial Markets in Asia: Policies, Paradigms and Performance. New York: Oxford University Press. Norin Chuo Kinko 農林中央金庫 [Agricultural and Forestry Central Bank]. 1973. Norin Chuo Kinko 50-nen no Ayumi 農林中央金庫50年の歩み [Fifty years’ history of Agricultural and Forestry Central Bank]. Intelligence Division, Norin Chuo Kinko. Norin-sho Keizai Kosei-bu 農林省経済更生部 [Ministry of Finance, Department of Economic Rehabilitation]. 1938. Nosangyoson Keizai-jijo Chosa 農産漁村経済事情調査 [Research on economic status of villages]. Noshomu-sho Nomu-kyoku 農商務省農務局 [Ministry of Agricultural and Commerce, Agriculture Office]. 1914. Sangyo Kumiai Yoran 産業組合要覧 [Directory of industrial cooperatives]. Rhyne, Elisabeth H. 2001. Mainstreaming Microfinance: How Lending to the Poor Began, Grew, and Came of Age in Bolivia. West Hartford, CT: Kumarian Press. Robinson, Marguerite. 2001. The Microfinance Revolution: Sustainable Finance for the Poor. Washington, D.C.: World Bank. Sacay, Orlando J.; Randawa, B.; and Meliza, Agabin. 1996. The BAAC Success Story: A Specialized Agricultural Bank under Government Ownership. Washington, D.C.: Financial Sector Development Department, World Bank. Sachs, Jeffrey. 1997. Lessons from the Thais. Financial Times, July 30, 1997. Sangyo Kumiai Chuokai 産業組合中央会 [Central Union of Cooperatives]. Various years. Sangyo Kumiai Nenkan 産業組合年鑑 [Yearbook of industrial cooperatives]. Seri Phangphit; and Hewison, Kevin. 2001. Thai Village Life: Culture and Transition in the Northeast. Bangkok: White Lotus. Thaler, Richard H.; and Shefrin, Hersh M. 1981. An Economic Theory of Self-control. Journal of Political Economy 89(2): 393–406. Vogel, Robert C. 1984. Saving Mobilization: The Forgotten Half of Rural Finance. In Undermining Rural Development with Cheap Credit, edited by Dale W. Adams, Douglas H. Graham, and J. D. von Pischke, pp. 248–264. Boulder and London: Westview Press. 1) Raiffeisen credit union confined its members belonging to a same Christian church community, parish. In Japan, article 9 of the Japanese Industrial Cooperative Act of 1900 stipulated the coverage of credit unions to operate within a village. Thai SGs have the same rule. 2) In Japan, some ROSCAs transformed into credit unions. Bouman (1995) observes the same. 3) A typical polar case is Grameen Bank that relies on external financing almost fully. Grameen Bank, thus, needs to equip several devices to maintain its effective functioning, such as peer groups to reduce lending risk. 4) Exactly speaking, the members purchase share rather than make a deposit. One share is priced at 10 baht per month. 5) This makes Lao SGs ask for collateral that is usually durable goods such as motor bike, television, refrigerator. 6) Twenty members resigned during the initial stage of the group development. Though they proposed to re-participate in the group, their request was rejected. This is because the group regulation states that the re-registration of a person who resigned from the group will not be accepted. 7) The question is “suppose you get 5,000 baht as windfall income, how do you allocate the money among the followings.” The options are indicated in Table 7. 8) Note that there were numerous informal SGs prior to 1900, best known of which is Hotokusha in Shizuoka Prefecture initiated by Sontoku Ninomiya. They were registered as credit unions after the enactment of the Industrial Cooperative Law. 9) Purchasing unions dealt with various commodities including agricultural inputs and daily necessities at cheaper prices through joint procurement. Production unions, later renamed as utilization unions, produced joint production by members. 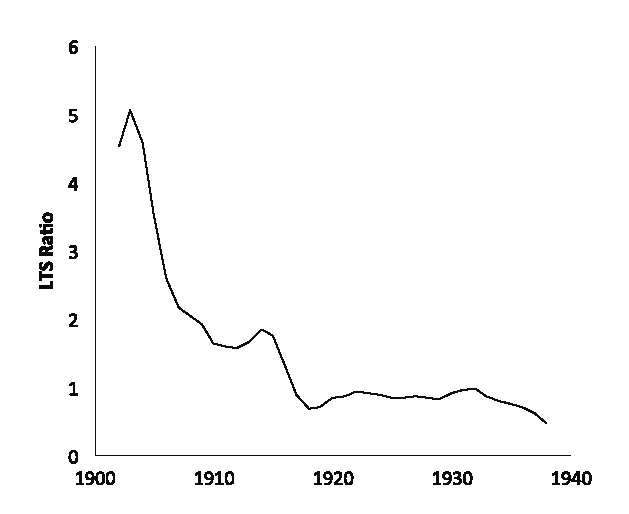 10) The rate hit a peak at 48% around 1930 (Ando 1979). 11) The proportion of nitrogen input from chemical fertilizer to total nitrogen input for agriculture was 15.7% in 1898–1907, 30.4% in 1908–17, 42.1% in 1918–27, and 46.2 % in 1928–37 (Hayami 1973). The other source of nitrogen is natural manure. 12) The association disseminated their operation information through the report titled Kensho Sangyo Kumiai [Commended Industrial Cooperative]. 13) The postal savings system that started in 1875 played another vital role in mobilizing savings from the rural sector in Japan. Due to a space constraint and the fact that the system did not offer loan services, we make no direct reference to it. 14) Note that the ratios are not more than 1 in the credit unions of Lao and Thailand, because their funds for loans are furnished with almost solely members’ savings. 15) Note that this paper does not discuss overall resource flow between agriculture and industry. For details, please refer to Ishikawa (1967). 16) The accounts of urban communities were opened at the Government Savings Bank.